While Dartmouth has had its share of real murders, this particular Dartmouth Murders, is the title of a work of fiction, possibly the first work of murder mystery fiction to feature the College, at least in book form. 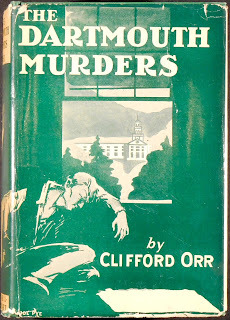 The story was perpetrated by Clifford Orr, Class of 1922, who would have lived through a real murder at the College in his sophomore year, but that’s a different story! Clifford’s fictional murder is nothing like the real one. Instead it starts with the main character, Kenneth Harris, finding the body of his roommate hanging by his neck from the fire escape (in those days the fire escape was a rope that student would have to shimmy down in the event of a blaze). What appears at first to be a suicide quickly turns more sinister. Orr first published the piece in serial form in College Humor under the title "The Dartmouth Mystery," though there is little if any humor in his piece. The story was then picked up by Farrar and Rinehart in the company’s inaugural year (1929) and made into a book. 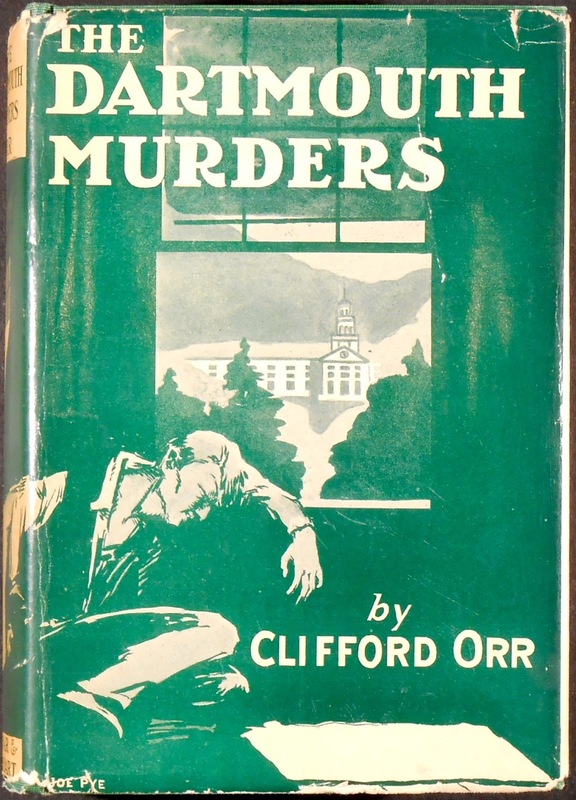 While Orr went on to publish another mystery with them, The Wailing Rock Murders, his final book, allegedly set on the Cornell campus, never made it into print. The Dartmouth Murders was made into a movie in 1935, titled A Shot in the Dark. The New York Times panned the movie version for which Orr wrote the script. The Dartmouth Murders is full of familiar Dartmouth locations and references. For instance Kenneth Harris is a resident of North Mass, just as Clifford Orr was as a student. But when the clock strikes the hour it is not the Baker Tower clock as it would be today, but the Dartmouth Hall clock (Baker hadn’t been built when Orr was a student). Webster Hall, the Chapel and the Inn also get at least passing mention. Hanover establishments of yore also make appearances, The Dartmouth National Bank and Campion’s for instance, but ultimately the book is more about the mystery and Dartmouth is very much a backdrop. 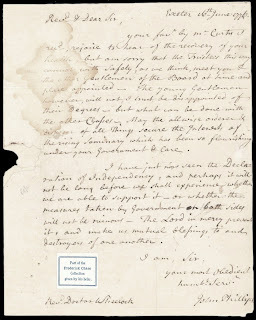 In addition to several copies of the book, some signed by the author, we also have the original manuscript as well as Orr’s own letters home to his mother during his years at Dartmouth. Orr, who started out as a literary associate at Doubleday, Dorn & Co., and later became a literary editor at The New Yorker, also published some short literary pieces in The New Yorker and wrote song lyrics. He died in Hanover in 1951 after “a long illness” at the age of 51. 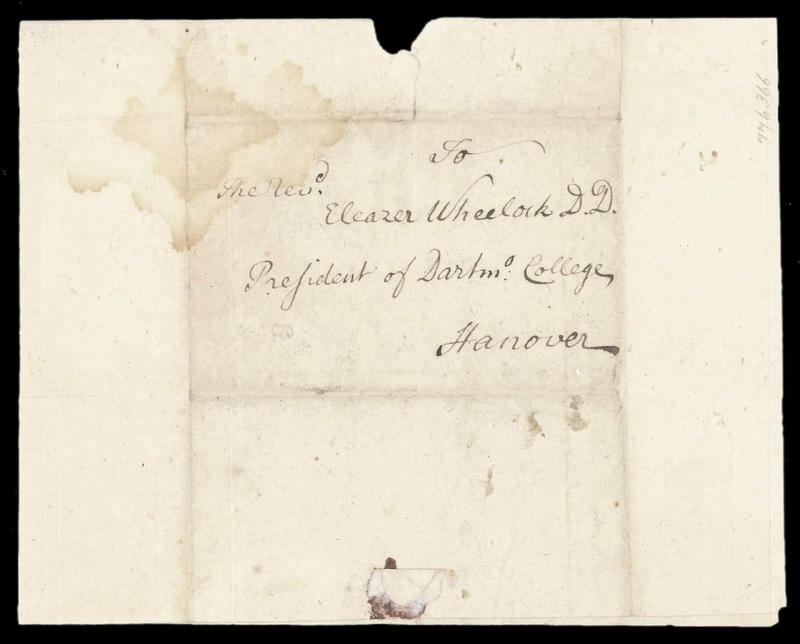 By 1776, Dartmouth College had been operating in Hanover for nearly six years, its student body had expanded from the 4 original students who came north with Eleazar Wheelock to about 90, and significant growth also had occurred in the population of the town. Clearly, Wheelock's enterprise was off to a very successful start. However, with unrest growing between the colonies and Great Britain, the College feared breaks with its patrons and the resulting financial hardships. New Hampshire's Royal Governor John Wentworth, who had been instrumental in the College acquiring its charter in 1769 and on many occasions in disagreement with the Crown on its handling of the colonies, nevertheless had been forced to leave New Hampshire, perceived as a loyalist. 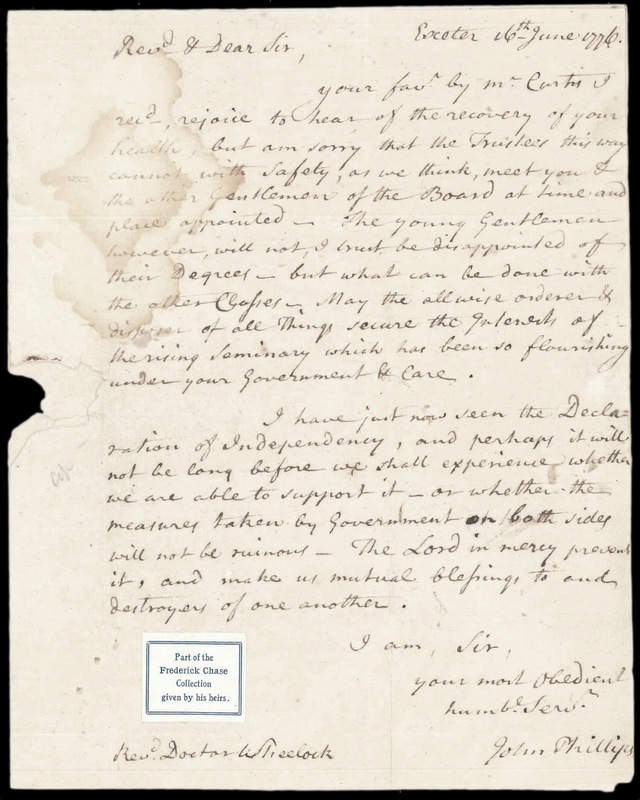 "I have just now seen the Declaration of Independency, and perhaps it will not be long before we shall experience whether we are able to support it - or whether the measures taken by Government on both sides will not be ruinous - The Lord in mercy prevent it, and make us mutual blessings to and [not] destroyers of one another." 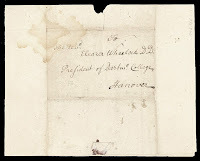 It is not completely evident how an Exeter merchant, albeit an important one, would have had access to the document. 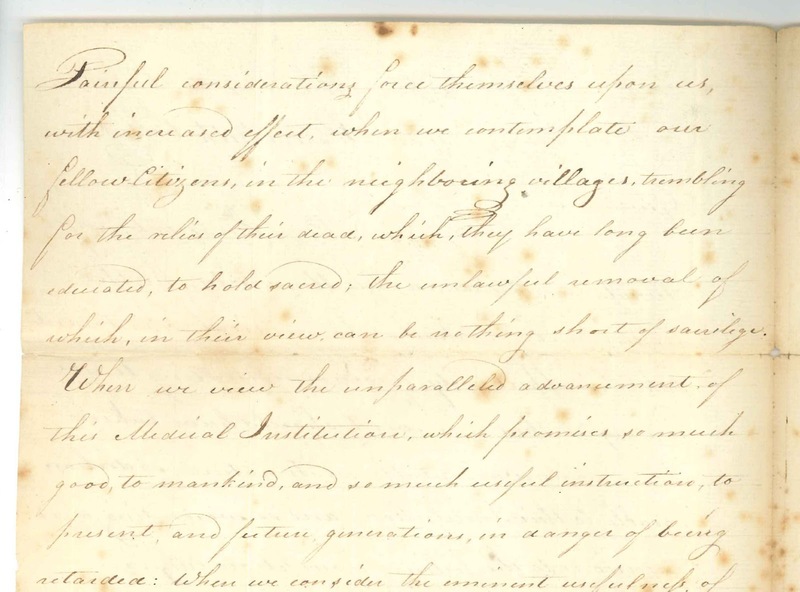 On the other hand, some scholars contend that there were dozens of declarations and legislative acts relating to separating from Great Britain issued by individual colonies prior to the document drafted and adopted by the Continental Congress in July. Could Phillips be referring to a New Hampshire effort? We would like to believe that he is speaking of THE declaration! Ask for D.C. Hist Mss 776366. There are some universal truths about working in the Archives, one being that at some point you will receive an item that is just too lovely not to keep, but which has no direct connection to the College, so you have no idea how to handle it. Rather than make a hasty decision, you place it on a shelf in your office until you retire, passing your indecision along to your successor, who pays the favor forward by giving it to her assistant, who, rapidly approaching retirement age herself, is determined to do better by her replacement. Case in point, the Legion d'Honneur, Chevalier, which we believe was presented to Margaret DeWitt Benedict in 1949 for her service to France during the two world wars. Margaret DeWitt Benedict was the daughter of LeGrand Benedict of the New York Stock Exchange, and granddaughter of James Benedict, President of the Chicago and Atlantic Railroad. Like many women of her station in life, she engaged in philanthropic activities. During World War I, Miss Benedict went to France with the Anne Morgan Volunteer Group, and remained there to found and direct the American Hospital of France. She was also founder of the Junior Guild of the American Cathedral of Paris. The Legion d'Honneur, France's highest decoration, was established by Napoleon in 1802. Anne Morgan, mentioned above and the daughter of J. P. Morgan, was the first American woman to be appointed a commander of the French Legion of Honor. Her organization, The American Friends of France, organized health services and provided basic necessities to non-combatants during WWI. Morgan returned to France in 1939 to assist evacuees. Prior to all her work in France, Anne Morgan was co-founder, with Eleanor Robson Belmont, of the Society for the Prevention of Useless Gift Giving (SPUG), an attempt to reduce the indiscriminant purchasing of Christmas presents, especially by people who could ill-afford them, and lead people to embrace the true spirit of the season. As the organization evolved (it existed until about 1940), its philosophy extended to the recipients of gifts as well, encouraging people to get rid of items they received that were neither useful nor beautiful. So, after much research on our Legion d'Honneur, I now have a handful of names: LeGrand and James and Margaret DeWitt Benedict, Anne Morgan, Eleanor Robson… none of whom I can connect to Dartmouth… and advice from SPUG about not throwing away anything beautiful. Perhaps it’s best to hope that the next Archives Supervisor likes this medal as much as I do. 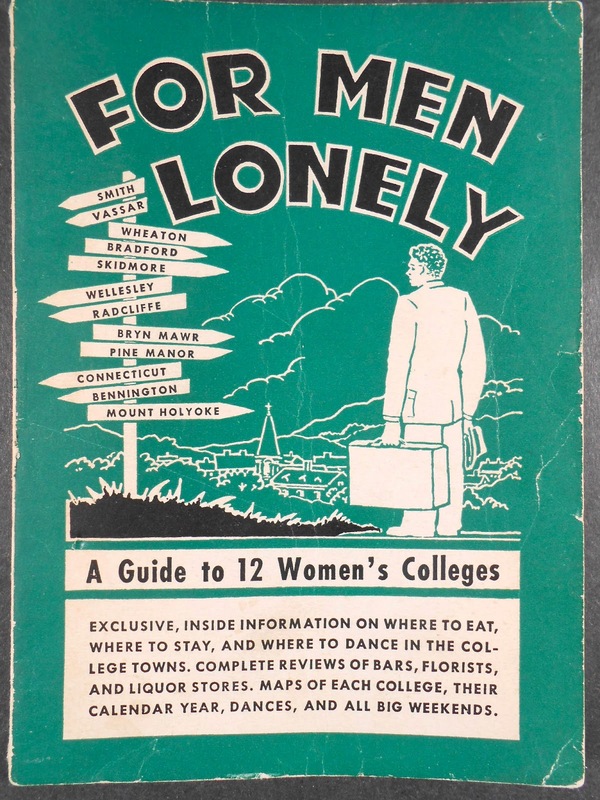 For Men Lonely is a guide to twelve women's colleges on the East Coast that was written by three Dartmouth students in 1947 before the college went co-ed. The book was inspired by one too many uncomfortable nights in the Northampton jail (for lack of better lodging). It is filled with useful information for sketchy college men seeking college women, specifically: maps of campus; the locations and contact information for local florists, liquor stores, and nightspots; and a listing of the annual social event dates and curfew times for each college. Some of the general descriptions contain moments of wry humor, such as this guide to the area near Bryn Mawr: "Most of the college crowd leaves Philly to the Quakers… and sticks pretty much to the suburban spots. If you know Philadelphia, you will too." Other entries are less endearing, such as a hopelessly misguided attempt to compliment Skidmore women by comparing them to racehorses at the local track. One can only imagine the desperation that would drive a young man to walk up to the bookstore counter with For Men Lonely in one hand and money in the other. Thankfully, having a look at the book nowadays doesn't require you to navigate any morally questionable landscape. Instead, guide yourself to Rauner and ask for Alumni J7278f, complete with the authors' autographs on the flyleaf. Dartmouth has long been a respected academic institution, rewarding its students with knowledge, new experiences and even some enjoyable social events. However, food may be the unsung hero of the Dartmouth experience. 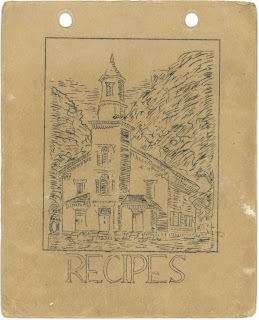 Hanover has created dozens of cookbooks over the last century, providing crucial instructions on how to feed the ever-hungry college student or Dartmouth-graduate. 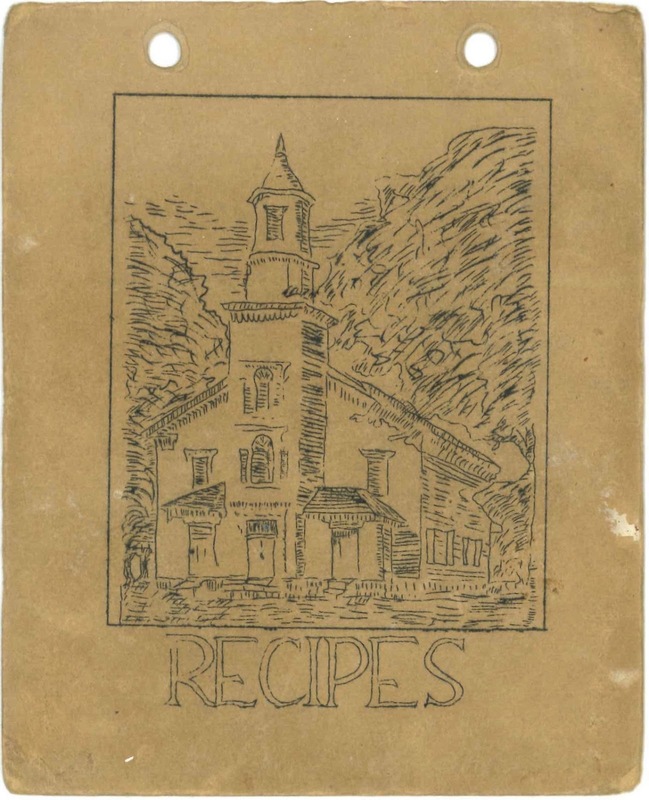 The White Church Women's Association in Hanover published the first Hanover cookbook, Recipes, in Rauner's collection in 1928. The 1920's woman was more resourceful than the twenty-first century cook, with an entire section dedicated to the uses for sour milk. Still, quality and ingenuity can go hand in hand. I would personally advocate for the increased twenty-first century consumption of "Rinktum Tiddy" and a dessert called "Hermits," based on their names alone. By the 1950s, Hanover had apparently taken a turn for the health conscious. 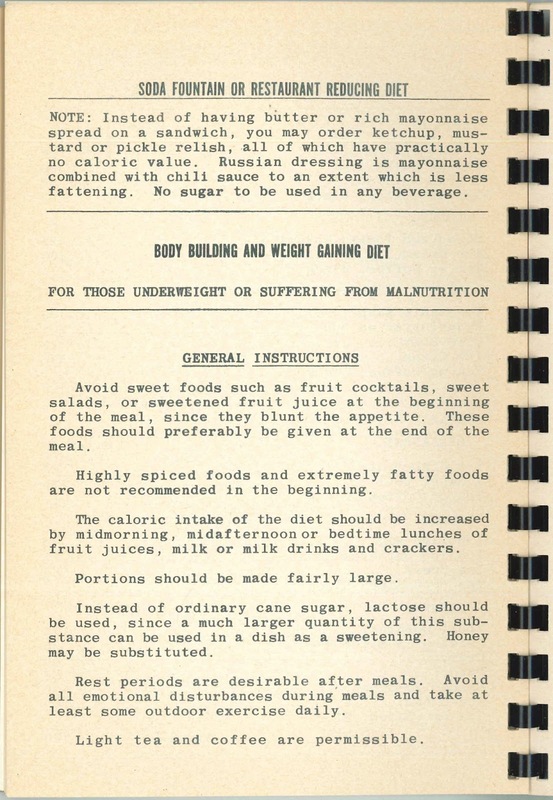 The 1950 cookbook of Hanover’s Favorite Recipes, compiled by the Grafton Star Grange, dedicates a large section to weight control. While the "Eighteen Day Reducing Diet" and the "Body Building and Weight Gaining Diet" don’t exactly fit modern day nutritional guidelines, they show a college town increasingly concerned with their waistlines. The cookbook even contains a weight chart, showing the correct correlation between "Weight in Pounds (With Regular Clothes)" and "Height (with shoes on)." In the 1960s, Dartmouth began to celebrate its perceived culinary expertise. 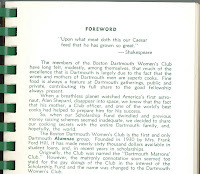 The Dartmouth Women's Club wrote in the introduction of Favorite Dartmouth Recipes that, "much of the excellence that is Dartmouth is largely due to the fact that the wives and mothers of Dartmouth men are superb cooks." Viewing the recipes from the 1960s, a modern reader may question this claim. 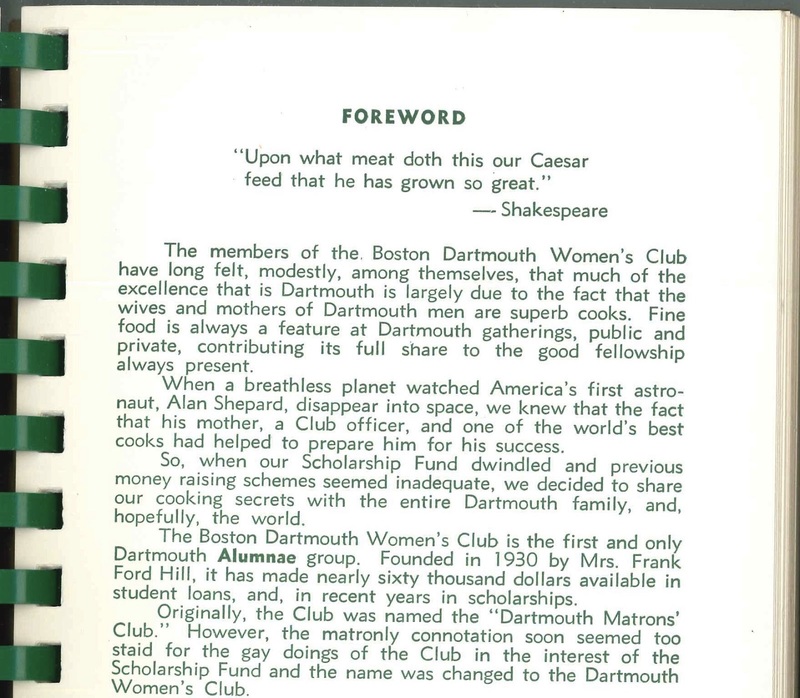 While many of the food creations in the 1961 College Town Cook Book and 1967 Tuck-Thayer Wives Club are likely delicious, a distinct handful would likely not agree with the stomachs of Dartmouth students in 2013. One major objection: the incredibly common use of Jell-O in any dish. From salads to meal loafs, gelatin seems to have been the go-to ingredient in Hanover and Dartmouth kitchens in the 1960s. Cookbook creation has lagged in recent years. With coeducation, the College began to emphasize women's roles outside of wives, mothers and chefs. Nonetheless, there continue to be notable contributions to Dartmouth's cookbook collection. One such example is the Handel Society’s Culinary Notes, published in 1987. Each recipe in the book, published to support the musical ensemble founded in 1807, specifies not only the hometown of each recipe's author, but also his or her vocal part. 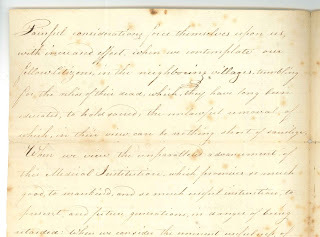 "Trembling for the Relics of Their Dead"
Published on April 2, 2013 April 5, 2013 Author Rauner LibraryLeave a comment on "Trembling for the Relics of Their Dead"
In 1810, a group of Dartmouth Medical School students was caught removing a body from the Norwich, Vermont, cemetery. Bodies for dissection were hard to come by at the time and grave robbing was not as uncommon a practice as one might think. Normally, medical schools obtained bodies from prisons as condemned criminals were often further punished by having their bodies given over to science. However this offered only a limited supply of cadavers for study. The same year Dartmouth opened its medical school, the state of New Hampshire stiffened the penalties for grave robbing knowing that there would be increased demand for the dead. Painful considerations force themselves upon us, with increased effect, when we contemplate our fellow citizens, in the neighboring villages, trembling for the relics of their dead, which, they have long been educated, to hold sacred; the unlawful removal of which, in their view, can be nothing short of sacrilege. The villagers are reduced to trembling, uneducated peons who seem unable to differentiate between the relic and the reality. It seems the medical students are not so much sorry about what they did, but that the superstitious townspeople believe it wrong. There are gruesome stories in the Archives. 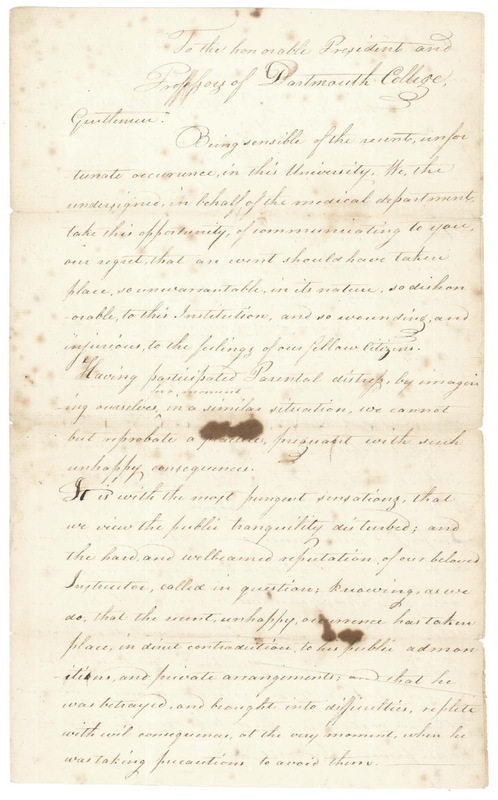 This letter is featured in the current exhibit, The Body: Depressed, Flayed, and Stolen from the Grave curated by members of Sienna Craig's "The Values of Medicine" class. It will be on display through June 20th, after which you can ask for Mss 810900.6. Published on April 2, 2013 April 5, 2013 Author Rauner LibraryCategories Rauner Special Collections LibraryTags Dartmouth History, History of Science, Manuscripts, Special CollectionsLeave a comment on "Trembling for the Relics of Their Dead"
The Dartmouth College Archives are full of great stories. With a history as long and varied as ours, there is always something interesting to uncover. We tend to get most excited when we find a story with good teaching or research potential. A favorite is the life of Charles "Stubbie" Pearson '42, a tragic hero in the history of Dartmouth College. He was the 1942 valedictorian, captain of the football and basketball teams, a poet, scholar, and inspirational leader on campus. Along with dozens of his classmates, he joined the Navy upon graduation and became a Navy pilot. In 1944 he was killed in action in the Pacific while dive-bombing an enemy ship. Several years ago, Special Collections Librarian Jay Satterfield worked with Stephanie Boone in the Writing program to develop a class session where students puzzled out Stubbie’s life history as a way to help them understand the construction of narrative and to highlight the use of primary sources in building research projects. The exercise grew out of Stephanie’s request to find primary sources that would help her students understand the cultural milieu of World War II, the setting of Michael Ondaatje’s The English Patient, to show them a new way to read the novel, and to show them the use of primary sources in understanding and constructing narratives. Importantly, it demonstrated how finding the story in sources leads to exciting research questions that students do not anticipate. They begin to see how the gaps in narratives generate some of the most compelling research experiences. In fact, over the six years that we’ve used this exercise, students experience this trip to Special Collections as literally their first experience in using primary sources. Coming face to face with Stubbie’s story allows students to identify with Stubbie and to understand the cultural context of Dartmouth, common ground on which both Stubbie and the students stand. Importantly, this exercise underscores the value of the collaboration between librarians and professors, one that creates a new kind of space for intellectual enrichment. Out of this particular collaboration, Stephanie and Jay recently wrote up the experience, which has been published in Past or Portal? 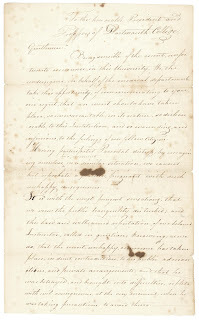 : Enhancing Undergraduate Learning through Special Collections and Archives (New York: ACRL, 2012).